SAN FRANCISCO—Statewide court filings in the California superior courts decreased in fiscal year 2012–2013, continuing a trend that began the prior year, according to the Judicial Council’s 2014 Court Statistics Report (CSR). The 7.7 million case filings represent a 9.7 percent decrease from the previous year. Most of the decline occurred in limited jurisdiction cases—misdemeanors and infractions in the criminal case category and small claims and limited civil (less than $25,000) in the civil case category. At the same time, some complex case types—including felonies, probate and mental health cases, dependency cases, and certain unlimited civil cases concerned with personal injury, property damage, and wrongful death—continued their increase from last year. For example, felony filings increased by 7 percent, dependency filings increased by 7 percent, and filings involving mental health were up by 3 percent. Cases involving personal injury, property damage, and wrongful death were up by 2 and 3 percent, whereas other types of unlimited civil cases were down by 9 percent, resulting in a 6 percent decline overall in unlimited civil cases from the previous year. The CSR provides detailed statewide caseload data for fiscal year 2012–2013 and 10-year trend data on a wide range of court business in the Supreme Court of California, the Courts of Appeal, and the superior courts in the state’s 58 counties. Comprehensive county-level data for the most recent fiscal year are published in the online version of the report, along with a summary of the major filings trends, on the California Courts website. Article VI, section 6 of the California Constitution requires the Judicial Council to survey the condition of business in the state courts and to report and make recommendations to the Governor and the Legislature. 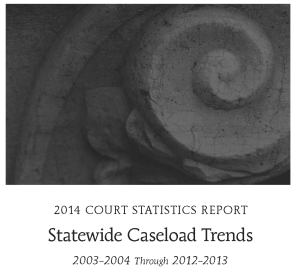 A snapshot of the court caseload data in the CSR for fiscal year 2012–2013 follows. The Supreme Court issued 94 written opinions in fiscal year 2012–2013. Filings totaled 7,813, and dispositions totaled 8,269. Automatic appeals arising out of judgments of death totaled 13 cases, and the court disposed of 21 such appeals by written opinion. The Supreme Court ordered 16 Court of Appeal opinions depublished in this fiscal year. * Since 1996, the California Supreme Court has issued additional workload statistics using a reporting period of September 1 through August 31 of the following year. This time frame best corresponds to the filing of the Supreme Court’s opinions. View the court’s September 1, 2012–August 31, 2013 annual statistics. Total contested matters for the Courts of Appeal totaled 20,391, made up of 13,020 records of appeal and 7,371 original proceedings. Dispositions in the Courts of Appeal totaled 22,092. Of these dispositions, 14,778 were notices of appeals, and 7,314 were original proceedings. Dispositions of appeals by written opinion totaled 9,429, appeals disposed of without written opinion totaled 3,426, and appeals disposed of without a record filed totaled 1,923. Dispositions of original proceedings by written opinion totaled 470, and original proceedings disposed of without written opinion totaled 6,844. Statewide, 9 percent of Court of Appeal majority opinions were published.